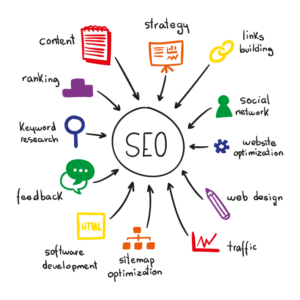 Search Engine Optimisation (SEO) - quality inbound traffic! Google now processes over 40,000 search queries every second on average, which translates to over 3.5 billion searches per day and 1.2 trillion searches per year worldwide.Google has undoubtedly become an integral part of everyday life! Did you know that over 75% of people won’t search past the first page? Therefore if you looking for quality inbound traffic you need to ensure your website is set up properly for SEO and at the same time “eye-popping”. SEO is not easy, it’s a skill that requires constant change to stay abreast with Google’s SEO monthly updates.